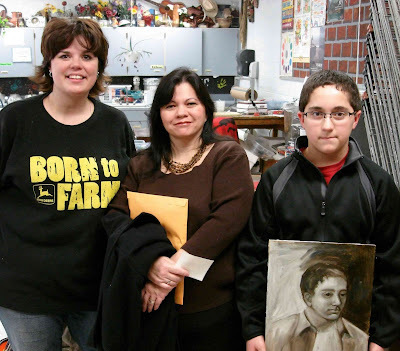 Here is the the art instructor over at CMS (Ms. Leeper), Wade and I. We gave an art presentation and demonstration for all of the art classes there. It was really enjoyable and I got about 100 wonderful thank you notes from the kids. These kids were very attentive, practiced some of the art principles, and asked great questions. Ms. Leeper has taught them well. One of the things I learned was that I talked more than I painted which made me realize that I should break things down into 2 presentations - 1) demonstrating painting and 2) talking about becoming an artist. So, next time I'll choose one or the other... or both at different times. But, I am glad I did it. Thanks, CMS Art Students!! !